To get to this point, from a blank canvas it has taken the best part of 3 days. 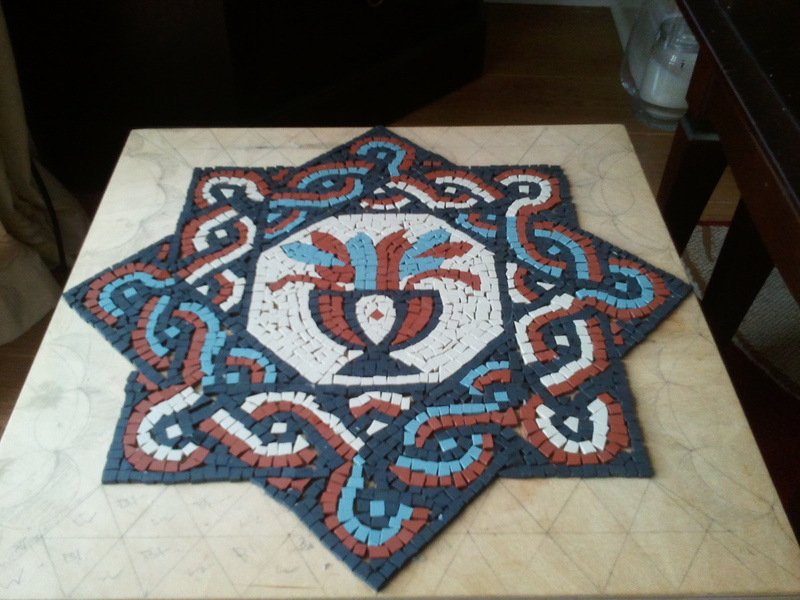 One day to plan and map out the design, then two days of shaping tesserae for use then laying to design. Since the table is not huge it has developed quite quickly, with the central patterns completed I must admit I’m happy with the way its coming out insofar. You may question my apparent obsession for sticking tiles on tables and why not, everyone is different., however there is a logic to my actions. Tesserae make durable surfaces, indeed the original cause for mosaics came from the need to create durable floors. Stones were forced in mud floors to raise themselves off the cold earth then over time people began to make patterns out of the stones lain in the floor. Eventually greater levels of design were sought until the ancients started manufacturing stones and tiles to create floors and the art of mosaic. Wood however is not quite so durable, many of us would have noticed water marked, or scratched tables in our homes, so with that in mind I’ve applied mosaics to tables because they cover the wood in a more durable materials whilst making successful and interesting surfaces that allow you to create what might be described as a niche craft.